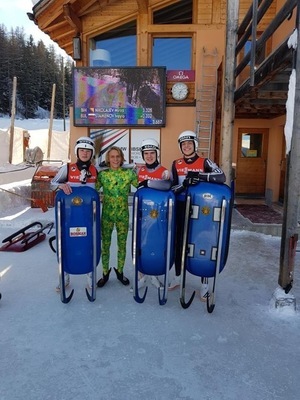 Noosa teenager Pierce Ludvigsen began his love affair with luge at the age of three when he first saw it on the television while watching the Winter Olympics. “That’s amazing I’d really like to try that,” he thought and while that thought never left him he didn’t really expect to fulfil his dream. 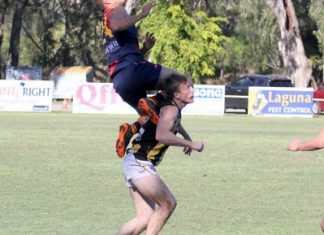 But in what is akin to Noosa’s own version of the Jamaican bobsled team seen in the film Cool Runnings, the Good Shepherd Lutheran College Year 12 student has not only joined the sport but is on track with training for the 2020 Olympics. In only his second time on ice Pierce was last week hurtling down luge runs in training with the International Luge Federation in St Moritz, Switzerland and competed in the Luge Junior World Cup competition. It was a series of freak coincidences that landed Pierce in to his chosen sport. While in the school library a couple of years ago the Winter Olympics were being screened on television and he was watching the luge. He mentioned it was a sport he had always wanted to try and by chance it was to Karen Flynn of Gympie who just happens to be the junior development coordinator for Luge Australia. “She was surprised,” Pierce said. Karen is a former luge athlete and has worked in the field for many years in the United States and Australia. Part of her role includes introducing kids to the sport by training them using luge sleds with wheels which are run on the road. “Pierce was a natural as soon as I put him on the sled,” Karen said. 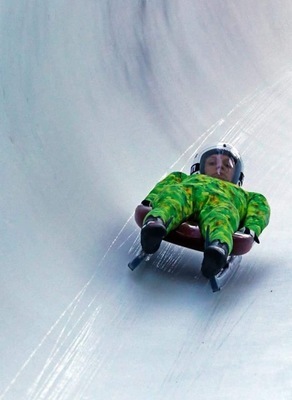 There are no luge tunnels in the southern hemispheres so despite the road training there was no way of knowing how Pierce would be on the ice until he tried it, Karen said. So in 2017 Pierce travelled to Japan for two weeks training before another two week training session last month at St Moritz, making his total training on ice only four weeks. Pierce is one of only two young people in Australia training with the International Luge Federation. Ada Lacey of Melbourne also attended the training. Despite the short period Karen was thrilled with his progress. “He just looked so good on the sled,” he said. His training in Australia is largely physical training to maintain his fitness which is not a problem for Pierce who is also an Australian age swimming championships competitor and last year’s bronze medal winner in the 7.5km swim at the Queensland Open Water Championships. Pierce is also involved in volleyball, waterpolo, surfing and skateboarding, gained his Black Belt in karate at the age of 12 and teaches young children to swim at Learn to Swim classes at Diamond Swim School. Pierce will return to Europe in October to start training for the luge world cup and the Olympics and Karen has confidence in his ability.